ContoursBaby.com / Blog / Babywearing / Legs In, Legs Out, Froggy Legs, Oh My! Legs In, Legs Out, Froggy Legs, Oh My! Legs-In: The baby’s legs and feet are enclosed within the carrier. This is sometimes referred to as a newborn position. This is often used for newborns. Froggy Legs: The baby’s legs and feet are enclosed within the carrier in a manner that resembles a frog. This is when baby is in a legs-in position. The wearer should be cognizant of where the baby’s weight is resting to be sure it isn’t on the baby’s feet (we don’t want tiny baby feet to bear the whole weight of the baby!). When the carrier is properly tightened across the baby’s back, it supports the baby’s weight instead of being on the baby’s feet. This can be done in a ring sling, meh dai, woven wrap, and stretchy wrap. When using a buckle/SSC (soft-structured carrier), read the user’s manual as carriers have different rules related to testing and structure. Legs-Out: The baby’s legs and feet are outside the carrier. The baby sits on a portion of the carrier with legs hanging down. This may be in a narrow-based or ergonomic carrier (a carrier that supports baby’s bum and legs-in a seated position from one knee to another). This can be done as soon as baby is naturally ready to be legs-out. This can be newborn through several weeks old. M Position: Weight is on the baby’s bum with knees higher than his/her bum. This forms an “M” shape. This is typically done in an ergonomic carrier and when baby is in a legs-out position. Look at the baby’s natural position. Are the legs curled up in a fetal/newborn position? Are they hanging down? Follow baby’s lead! Put the carrier around the baby in whichever position the baby is in naturally (as long as it is allowed per carrier instructions). If baby’s legs are naturally curled up, baby should be legs-in. If baby’s legs are naturally hanging down, baby should be legs-out. We want to support what our babies do naturally — never force them into a position that makes them uncomfortable. 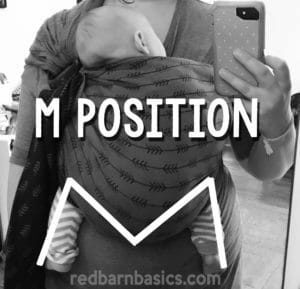 After you determine the optimal positioning for your baby, put the carrier around the baby supporting that position. Some babies may have a period of transition when they are starting to want to be legs-out but may still be legs in when tired or other times throughout the day. Continue to follow what your baby is doing naturally, even if it varies day to day. A baby who is starting to “stand up” in the carrier when doing legs-in is telling you that it may be time for legs-out. 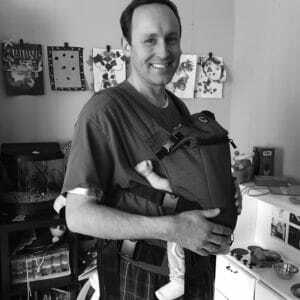 These rules apply to most carriers; however, make sure to read the instructions that came with your carrier or check with a babywearing educator to ensure you are aware of any specifics. My firstborn naturally started to drop his legs down and he was ready for legs-out in a carrier around two weeks. My youngest was legs-in using a froggy position until around five weeks. Between five and six weeks she started to stretch her legs-out when she was wide awake and by the time she was six-weeks-old, she was fully legs-out in an “M position”. In all, baby knows best when it comesto being carried. Follow your baby’s lead and you will be wearing your baby comfortably, safely, and in a way that supports baby’s natural needs. 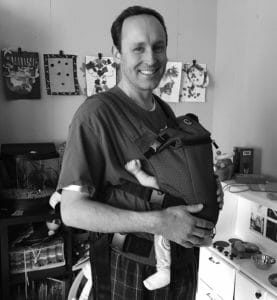 Stephanie Hopkins is a contributing writer who is a Center for Babywearing Studies graduate. Follow her story at redbarnbasics.com.